Snap(shot) Judgements are posts that will appear with no real regularity. It’s primarily a way for us to get thoughts and photos up as soon as possible, especially when we have no plan to write a feature-length column on the subject. Here, Gary makes it to the third of five rookie vendors he missed while at the Vendy Awards – A-Pou’s Taste. With all the carts and trucks running around, it was disappointing to see the only one really serving Asian dumplings was the Rickshaw Dumpling truck which, in my opinion, serves mediocre dumplings. 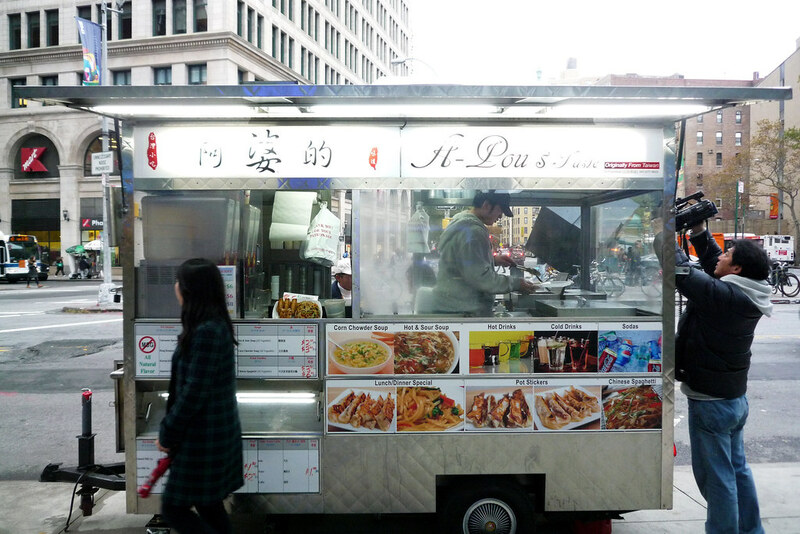 So it was a welcome sight to see the A-Pou’s Taste cart appear one night when I was walking along Astor Place back in the summer. It was just after a darts match so I was tired and just wanted to go home so I didn’t try them at the time. After missing out when they were at the Vendys in September, I made it a point to stop at their cart on my way to Eater one of these days. When I finally did, I was glad I had because these Taiwanese style dumplings are great. They’re the long kind, pinched in the middle and left open a little on the ends and they’re fried to a crisp on the flat side. Sometimes they get a little too crunchy for my taste but it’s preferable to it being under fried. They taste great though and that’s all I really ask for in dumplings.